Restaurant Review: Burger Night at Bread & Butter Farm | Out to Eat | Kids VT - small people, big ideas! We went to dinner the other night, and a parade broke out. That was after the dance party, but before the band played its second set. At Bread & Butter Farm's Burger Night, food is only part of the draw. Burger Night began two years ago as a way for farmers Corie Pierce and Adam Wilson to showcase their grass-fed beef, fresh-baked bread and farm produce. Their farm isn't certified organic, but the two believe in raising animals and growing crops as naturally as they can. They offer the fruits of their labor to the community at local stores, their farm stand and Burger Night, which takes place every Friday from May to September. It was a hot, sunny night when my family of four toted beach chairs from the "parking lot" — a field, really — on Cheesefactory Road to the farm. The place was hopping. Tons of little kids roamed the property freely, and the heady aroma of grilled beef engulfed us. Despite the crowds, we didn't have to wait long to order. The kids got à la carte burgers; the adults went for the "Best Deal Dinner Plate Cheeseburger" — a cheeseburger on a homemade roll with two salads. The only other menu options are pork or beef hot dogs and Vermont Bean Crafters veggie burgers. Nonalcoholic drinks and desserts are also available. We set up camp on the gently sloping lawn, in the shade of the picnic shelter. From there, we had a view of the band and the bucolic landscape. The musicians finished their first set as we waited for our burgers, which were ready fast and downed even faster. "This is really good," my son kept mumbling around bites of beef and bread. 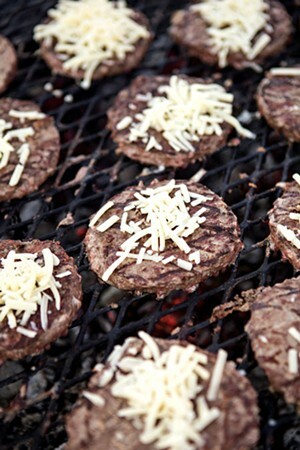 The burgers are cooked medium and carry a true beefy flavor, with just the right amount of salt. Though the texture was not entirely satisfying — my husband wondered if it had been frozen — it was overall a good burger. Cheese and condiments were a little skimpy; my daughter was crushed when she realized there was no mayo. Without chips or fries, I probably should have ordered double burgers for my two hungry 11-year-olds. My daughter made do by eating most of my potato-and-spinach salad with lemon-garlic dressing. I was glad she left me the kale salad. Finely chopped and tossed with peppy, lemony ginger dressing, it was delicious. Even my husband, no great kale lover, enjoyed every last bite of his. While we ate, folk musician Chris Dorman — Farmer Corie's husband — came onstage and led the under-6 set in a song that had them falling down and giggling. Then he led them on a parade around a giant bubble-making station, past a face painter and by the craft table, where my daughter was making a tissue-paper flower. The kids appeared to be having the time of their lives. The same went for the parents — at least, those who weren't busy chasing their kids. Everyone seemed to be appreciating the best of a Vermont summer evening: good farm-raised food in a beautiful setting, where the kids can climb on wood-chip piles until they're ready to collapse and fall asleep on the car ride home. Know before you go: Bring picnic supplies — chairs, blankets and drinks are welcome — but leave other food, and the family dog, at home. And remember, it's a working farm. Don't let kids climb on the tractor or touch the electric livestock fences.